The World Health Organization declared Zika virus outbreak in Latin America and other areas a public health emergency of international concern, because Zika virus can cause birth defects and neurological problems. Since then, Zika virus has been a topic of concern in the news media. 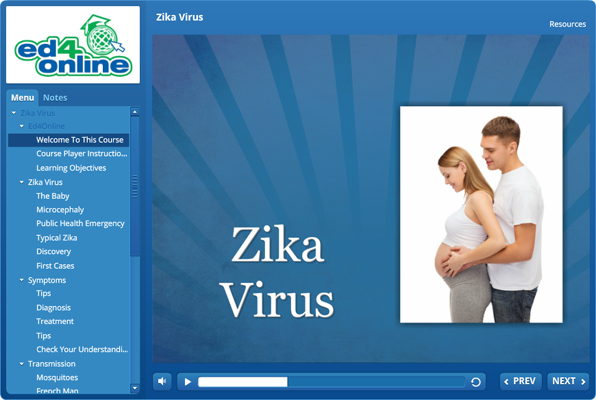 This course talks about the history of the virus. It also discusses, known virus symptoms, how it is transmitted, strategies for prevention, and many other aspects of the virus. We at Ed4Career want to keep you informed! Who are we? We are Ed4Career! Ed4Career provides high-quality online education courses for a diverse group of universities, colleges, businesses and health and human service companies. We provide courses from Healthcare and Business to Legal and Skilled Trades plus many more. If you have any questions about this course or any of our other courses or programs. Contact us at info@Ed4Career.com or give us a call at 727-824-7800.